A striking terminal and control tower mark the site of the Ronald Reagan Washington National Airport--renamed in 1997 after being known simply as "National" for more than 50 years. The billion-dollar renovation of the airport on the Potomac took more than four years to complete. A spectacular view of the Mall's monuments and the Capitol building--with the Potomac in front--is one attraction of the glass and steel terminal. In 1941, National Airport replaced an airport at the Pentagon known as Washington-Hoover airport, perilously located between Route 1 and Military Road. The cost was $15 million, authorized by Franklin D. Roosevelt while Congress was in recess. Land was reclaimed from the Potomac's mudflats to build a runway. 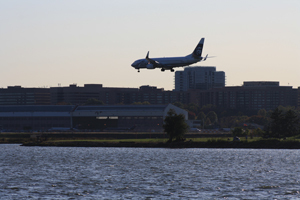 The airport was built on the Potomac on Virginia shoreline wetlands using fill dredged from the river channel. The land where the airport is located once belonged to John Parke Custis, son of Martha Washington by her first marriage. Because of its convenient location, National was an instant success, handling 636,000 passengers. In 1958, the North Terminal opened to alleviate crowding. In 1974, a Metro subway station opened at the airport--but not close to the terminal (that problem was cured with the new terminal). By 1993, traffic at the airport peaked with more than 16 million passengers. But the convenience of the airport also was the source of serious controversies. When jets were introduced to the airport in 1966, complaints arose from nearby communities and along the flight paths up and down the Potomac. Today a curfew applies to louder, older airplanes; pilots must follow noise-abatement procedures.